We kick off this holiday-shortened week with a digital painting inspired by a Beatles song. What you see at the top of this post is “Lucy In The Sky With Diamonds,” my take on the third song on side one of Sgt. Pepper’s Lonely Hearts Club Band. Coincidentally, the song was inspired by a piece of art itself. One day a very young Julian Lennon brought home a drawing of a classmate from school, and when his father asked what it was, he replied, “That’s Lucy in the sky with Diamonds.” John Lennon then was inspired to write the song, and that piece of artwork is now in the collection of Pink Floyd’s David Gilmour. This piece of artwork, as seen above, is digital, and you can see a bigger version by clicking on it. I sort of know a lot about the Beatles, but aside from the fact that I am a Beatles geek extraordinaire, I had another reason for creating this particular piece. I’ve been hearing this song a lot lately. 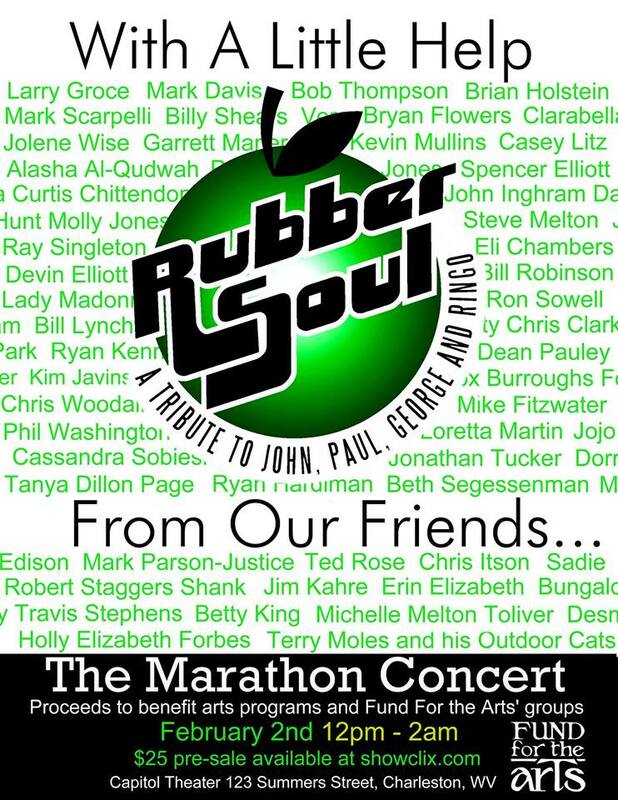 On February 2, Mark Scarpelli and his excellent Beatles tribute band, Rubber Soul, will perform a marathon of over 200 Beatles songs in a 14-hour concert as a benefit for Fund For The Arts. 200 songs is a heck of a lot for one band to perform, so Mark is calling this show, “With A Little Help From Our Friends” as an all-star lineup of top local talent will all chip in and take over singing or playing for a song or two (or more) so that the band does not drop dead of exhaustion at the end of the night. Joining Rubber Soul for this lengthy expedition through the Beatles’ songbook will be Larry Groce, Ron Sowell, Julie Adams, Ryan Kennedy, Ryan Hardiman, Spencer Elliott, John Inghram, Jonathan Tucker, Casey Litz from The Company Stores, Phil Washington, Kim Javins and many, many more. Among the “many, many more” joining in will be Gazette-Mail mainstay, “One-Month-At-A-Time” Bill Lynch. There’s another notable name joining the line up: My beautiful wife, Melanie Larch, will be singing lead on “Lucy In The Sky With Diamonds,” and as such she has been listening to the song quite a bit of late. 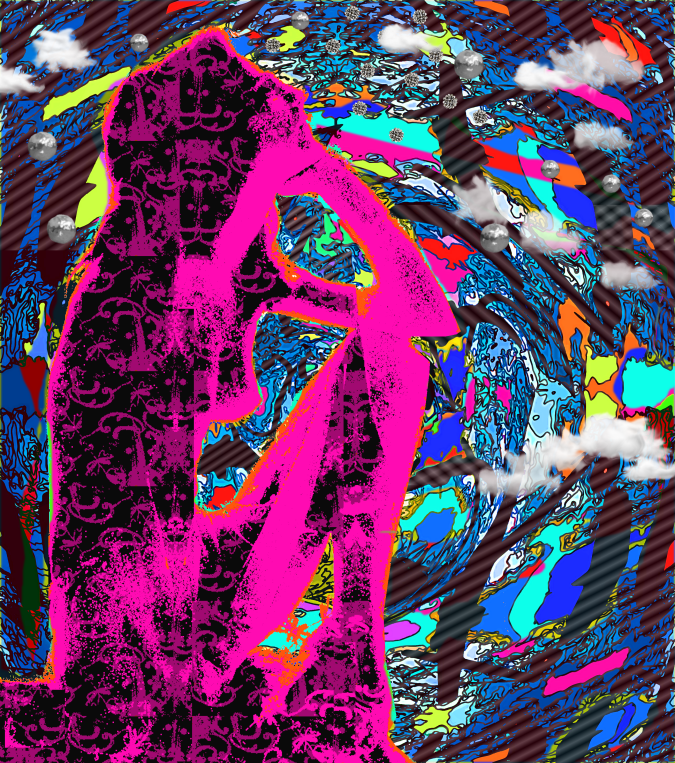 The song got into my head, and I turned it into the piece you see at the head of this post. Proceeds from The Marathon Concert will benefit Fund For The Arts, and the show kicks off at noon on Friday, February 2, at the Captiol Theater, 123 Summers Street, in Charleston. There is a $25 pre-sale available at Showclix, and I believe the ticket will allow you to come and go, just in case fourteen hours of Beatles is a bit too much for you to take in one sitting. PopCult Note: There is another reason I posted a piece of art inspired by something my lovely wife is doing today. Twenty-eight years ago on this day, I first met Melanie Larch at The Charleston Playhouse, during a a CD release party for Stark Raven. To keep this story small-worldy, at least two members of Stark Raven are performing along with Melanie on February 2.